The Austrasian Goat is a one man project from Julien Louvet started in 2008. Somewhere between Black Metal, Sludge, Punk, Dark Folk and Doom he created songs inspired by the forgotten lands of Austrasia. An area originally located in Belgium, France and Germany where some spots stayed pagan. Besides full length albums he released a lot of singles, splits, collaborations and compilation tracks. Principles of Disillusion was first put out on tape in Brazil and now available with more songs on two CDs by Music Fear Satan. Some releases were quite limited so a complete overview is a nice thing to have for those who were too late. The first cd kicks off with the songs of the four split EPs with Afflictis Lenteae, Chambre Froide, L’Acephale and Habsyll. 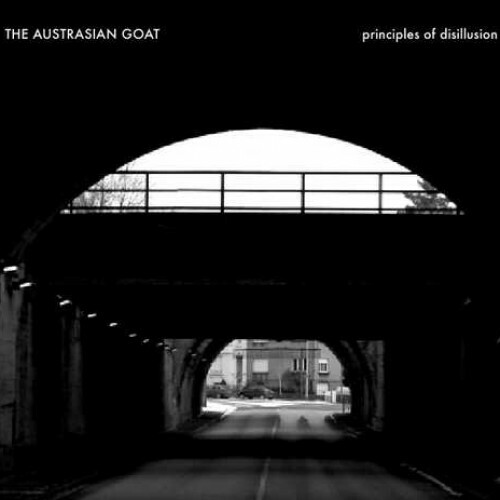 These six ones embark the harsh part of the Black Metal and Doom spectrum of The Austrasian Goat. The four original releases formed one large symbol visually with written text around it. These songs show the rawness of beauty of above mentioned genres. Next up is a 1 minute and 30 seconds minute song of the split with Muckrackers. The song was made for a video with industrial machines in it so it’s no wonder this short song has an industrial doom feel. ‘More Tunnels’ and ‘Putrid Hopes’ are taken from compilation albums and show a far more punk side of the Black Metal the French man has created; raw, in your face and sheer aggression. The disc ends with the EP Witch that is dedicated to all witches past, present and future. ‘Celebration’ starts off as a raw Doom/Black song and continues with acoustic guitars and female vocals towards a melancholic Dark Folk part until the dark metal edge kicks in again. Great song! ‘Amenorrhea’ is ritualistic Post Metal inspired and has the same melancholy over it. These are the best two songs of this compilation up till now. Disk two has the oldest material with three short Black Metal songs from the split with Never Presence Forever. It’s solid stuff just as the three songs from the split with Hallowed Butchery. These embody the style of The Austrasian Goat the best on these discs. Expect a fluently shifting between Black Metal, droning Doom and Dark Folk stuck in a snow storm. ‘Moon’ from the Hollow Sunshine split is written in the same feel. ‘The Gracious Fall of the Morning Light’ from the split with Neige Morte ends this long ride. What this song shows together with the others is how intense and raw the vocals of Julien shine through the foggy music he has created with The Austrasian Goat. For those who are into underground Doom and Black Metal and those who only own the full lengths this document is truly essential because in one piece you receive 19 songs that has stand the test of time far easily and never saw the borders of a particular genre.